Ratalaika Games is gaining a reputation for porting games to Xbox One that allow players to gain 1000 Gamerscore in a really quick time. Their latest release is no exception and some players are even claiming it dethrones Avatar: The Last Airbender: The Burning Earth as the quickest ever 1000 Gamerscore completion. Super Weekend Mode takes 4-5 minutes to get all of the Gamerscore, and we've put a quick guide together to tell you how to do it. The game is available now to purchase for the price of US$4.99/£4.99/€4.99. Thanks to K4rn4ge and Ow Nitram for discovering this easy completion on Twitter! After selecting Game Start, drop the game difficulty to a single yellow heart and make sure Auto-fire is turned on. Begin the game with the Princess outfit. This character is great for beginners and gives players more lives after they clear a stage. Players need to collect hearts while avoiding and shooting enemies. There are two ships at the bottom of the level that players move from side to side while doing this, and whith Auto-fire turned on, they'll automatically fire at enemies. Enemies don't appear until Stage 2, so all players need to do in this first stage is to collect hearts to build up their chain and their score. By collecting every heart that drops from the top of the screen, you'll level up for the first time, be able to string together a chain of 100 and accumulate 30,000 points before you complete the stage. This will get you four achievements. The That was easy achievement in Super Weekend Mode worth 75 pointsLevel up. The Chained achievement in Super Weekend Mode worth 100 pointsGet a 100 chain. The Getting some points achievement in Super Weekend Mode worth 101 pointsGet 30000 points. The Smells like roses achievement in Super Weekend Mode worth 75 pointsBeat Stage 1. Your chain and score continue to accumulate between stages. In Stage 2, the hearts begin to move around more and enemies begin to appear. White skulls need to be avoided, but the yellow bunnies need to be squashed between the two ships. By collecting all of the hearts, you'll be able to accumulate 50,000 points and kill your first invader bunny before you complete the stage. This will get you three achievements. The Master of points achievement in Super Weekend Mode worth 102 pointsGet 50000 points. The Bump 'n Crush achievement in Super Weekend Mode worth 77 pointsDefeat your first dust bunny. The Invader Bunny achievement in Super Weekend Mode worth 103 pointsBeat stage 2. In Stage 3, there are more enemies appearing from the top of the screen, as well as hearts to collect. This is the perfect time to get the achievement for dying for the first time, and the quickest way of doing this is to let a skull collide with one of your ships. By the end of the stage, you may possibly have accumulated 300 hearts. Combined with dying for the first time, completing the stage will net another three achievements. The Mortis achievement in Super Weekend Mode worth 75 pointsDie for the first time. 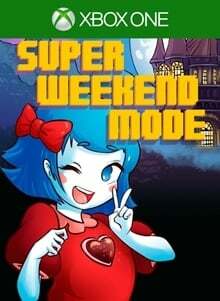 The Lots of love achievement in Super Weekend Mode worth 101 pointsGet 300 hearts. The This is a drill achievement in Super Weekend Mode worth 107 pointsBeat stage 3. At this point, you can quit to the main menu. The only achievement you'll have left is to play the game on the maximum difficulty. Start a new game, make sure Auto-fire is turned on, and pick any outfit you like. This time, though, make sure the difficulty is increased to the third heart, which is red. This achievement will unlock as soon as Stage 1 begins. If you haven't already gotten the achievement for collecting 300 hearts, finish the stage while collecting as many hearts as you can. The My hands are tired achievement in Super Weekend Mode worth 102 pointsPlay with maximun level of dificulty. Congratulations on another quick completion! We've got the full list of Super Weekend Mode achievements - check the list for guides to unlocking them.